As It Happened: The Fight Over The Debt Ceiling, Shutdown : The Two-Way With hours left before the country tops its borrowing authority, the Senate-crafted, bipartisan measure moves to the chaotic lower chamber. Party leaders are hoping to pass it with a coalition of votes from Democrats and Republicans. The bill — which makes no major changes to the new health care law — would end the first government shutdown in 17 years and avert a default. Senate Minority Leader Sen. Mitch McConnell, R-Ky., walks to the Senate floor after agreeing to the framework of a deal to avoid default and reopen the government, on Capitol Hill on Wednesday. The crisis is over. With about two hours before the country reached the debt ceiling, the House has approved the bill and it is now it's way to the White House. We've posted separately on that development and we are putting this live blog to bed. With less than four hours before the United States exceeds its borrowing authority, the Senate passed a bipartisan agreement that would reopen the government and avert the first default in U.S. history. The Senate, which scrambled to put together a deal after an agreement in the House crumbled on Wednesday, voted 81-18 in favor of the measure. On the 16th day of a partial government shutdown and with almost no room for false moves, all eyes now turn to the chaotic chamber that started it all. In the weeks leading up to this showdown, conservative House Republicans insisted that any bill that funds the government or lifts the debt ceiling also include language to either defund or delay the Affordable Care Act. Faced with the potential of severe economic fallout and unyielding opposition in the Democratically-controlled White House and Senate, Speaker of the House John Boehner relented today. "We fought the good fight, we just didn't win," Boehner told Cincinnati station WLW-AM. In a statement, he said while his party will continue to fight against Obamacare, Republicans would not block passage of the agreement crafted by Senate Majority Leader Harry Reid and Senate Minority Leader Mitch McConnell. In other words, Boehner will allow the bill to receive an up or down vote and hope that a coalition of Democrats and Republicans can make up the 217 votes needed to send the bill to the White House for President Obama's signature. It's unclear at what time the House will vote on the bill. "This legislation ends a standoff that ground the work of Washington to a halt this fall," Reid said, when he introduced the bill. McConnell called the proposed deal "far less than many of us had hoped for, but far better than what some had thought." "Pain has been inflicted on our nation for no good reason," Reid said during a press conference after the vote in the Senate. "We cannot make this mistake again." We're live blogging through the night, so make sure to refresh this page for the latest. During short remarks from the White House, Obama thanked Congressional leaders for coming together to broker a deal. And perhaps offering comfort to Republicans who have asked for negotiations on the budget, he said he was "eager to work with anyone on any idea that creates new jobs." He then used his oft-repeated line: "Democrats do not have a monopoly on good ideas." Obama said he would sign the bill as soon as the House passes it, and he would work to open the government "immediately." "There's a lot of work ahead of us, including winning back the trust of the American people" Obama said, also citing immigration and a farm bill as potential next steps for Congress. Obama closed by saying that while he was pleased that Senate leaders came together, "hopefully next time it won't be at the eleventh hour." "We have to get out of the habit of governing by crisis," Obama said. The White House says Obama will speak at 8:25 p.m. ET. The Senate voted 81-18 to approve the measure. Now the ball is in the House's court. The Senate is still voting, but the budget deal now has the 51 votes needed to pass. The bill has cleared a procedural hurdle with an 83-16 vote. The Senate is now voting on the real thing. The Senate has started taking a procedural vote on H.R. 2775. This is the so-called cloture vote, which ends debate on the measure and would pave the way for an up-or-down vote. Sixty votes are needed to end debate. A simply majority is needed to pass the bill. On the floor of the Senate, Ted Cruz, the Texas Republican who is considered one of the architects of the GOP position that contributed to this impasse, says "this is a terrible deal." The outcome, he said, would have been different had House and Senate Republicans stuck together. Cruz said it was "heartbreaking for the Americans" to see that the GOP pointed their "canons" at those Republicans in the House "who stood by the American people." Still, Cruz said, he is "encouraged," because before this episode, nobody thought the American people "would rise up." Finally, Cruz vowed to continue his fight to "stop this train wreck of a law (Obamacare)." With the Senate calling for a quorum, it appears that chamber may vote on a measure soon. There will be two key actions in the Senate: First they will vote for cloture, or to end debate on the measure, which requires 60 votes. If that is successful, they'll have an up-or-down vote on the measure, which needs 51 votes to be sent to the House. In the House, the measure will need 217 votes before it heads to the White House for President Obama's signature. If you're wondering, there are 200 Democrats and 232 Republicans in that chamber. Reacting to what appears to be good news from Washington, the markets closed higher this afternoon. The Dow rose 206 points or 1.36 percent. The Nasdaq and the S&P climbed about the same percentage. Heritage Action for America, one of the key conservative influencers who pushed for tying changes to the Affordable Care Act to the debt ceiling and continuing resolution, is encouraging lawmakers to vote against the Senate measure, saying it will include it "as a key vote on our legislative scorecard." As we reported earlier, The Club for Growth took the same position. Speaker of the House John Boehner says while his party will continue to fight against the Affordable Care Act, the House will not block the passage of the Senate measure. "Blocking the bipartisan agreement reached today by the members of the Senate will not be a tactic for us," Boehner said. "In addition to the risk of default, doing so would open the door for the Democratic majority in Washington to raise taxes again on the American people and undo the spending caps in the 2011 Budget Control Act without replacing them with better spending cuts. With our nation's economy still struggling under years of the president's policies, raising taxes is not a viable option. Our drive to stop the train wreck that is the president's health care law will continue. We will rely on aggressive oversight that highlights the law's massive flaws and smart, targeted strikes that split the legislative coalition the president has relied upon to force his health care law on the American people." "We fought the good fight, we just didn't win," Boehner told Cincinnati station WLW-AM. He said that the deal gives Congress time to sit down and work on the bigger fiscal issues. As for the vote, which is expected later today, Boehner said he would meet with his caucus, but he expects them to vote for the motion. "There is no reason for our members to vote no," Boehner said, adding that he expects the government to reopen on Thursday. Update at 2:51 p.m. ET. What's In The Deal? The deal struck by Reid and McConnell is seen as a pretty major concession from Republicans. If you remember, this all started when Republicans demanded to defund or in some way delay the Affordable Care Act by inserting language into the bill that funds the government. That impasse shut down the government, and talks suddenly turned to the Oct. 17 debt ceiling deadline. Republicans again insisted on modifications to Obamacare, as well as larger concessions on bigger fiscal issues in exchange for an extension of the country's borrowing authority. This deal, The New York Times explains, contains "virtually no concessions to Republicans, other than some minor tightening of income verifications for people obtaining subsidized insurance under the new health care law." "Under the agreement, the government would be funded through Jan. 15, and the debt ceiling would be raised until Feb. 7. The Senate will take up a separate motion to instruct House and Senate negotiators to reach accord by Dec. 13 on a long-term blueprint for tax and spending policies over the next decade. "Mr. McConnell stressed that under the deal, budget cuts extracted in the 2011 fiscal showdown were not reversed, as some Democrats had wanted, a slim reed that not even he claimed as a significant victory." The Club for Growth, a key conservative influencer, is urging a "no" vote on the Reid-McConnell deal. "There are no significant changes to ObamaCare, nothing on the other major entitlements that are racked with trillions in unfunded liabilities, and no meaningful spending cuts either," the group said in a statement. "If this bill passes, Congress will kick the can down the road, yet again." Unlike yesterday — when a similar announcement from Heritage Action helped to derail a House proposal — this probably won't have a huge effect. If the Senate compromise is to pass, it will be with votes from Democrats and Republicans in the House. Members of the Tea Party caucus were likely going to vote against the measure, anyway. Update At 1:20 p.m. ET. House GOP To Meet At 3 p.m.
House Republican leaders were set to brief their caucus on the Senate proposal at 3 p.m. ET, Reuters reports. White House Press Secretary Jay Carney, speaking at a briefing shortly after the deal was announced on the Senate floor, called on Congress to take the agreement and "pass it swiftly." "As soon as possible is essentially the recommendation that we have here," Carney said, warning that the debt ceiling deadline was ticking down. Asked whether President Obama had gotten any assurance that the proposed spending measure would pass both houses of Congress, Carney said the White House applauded the Senate leadership for its efforts but "we are not putting odds on anything." The deal would reopen the government at least until Jan. 15 and push the debt ceiling up until Feb. 7, the leaders say. Senate Majority Leader Harry Reid took the floor briefly to say he was waiting for Minority Leader Mitch McConnell to arrive before making any announcement. A House leadership aide tells The Associated Press that the GOP-led chamber will vote on the emerging Senate plan, but it's still "unclear" if there are enough votes to pass it. It's also not clear when a first vote would take place or in which chamber it would happen. Republican Sen. Kelly Ayotte of New Hampshire tells The Associated Press that it's her understanding that Senate leaders have reached a deal and that a formal announcement was forthcoming. "I understand they've come to an agreement but I'm going to let the leader announce that," Ayotte said. Reuters, quoting a "senior Senate aide," says that Senate leaders are "very close" to announcing a deal on the debt limit extension and that the chamber would move "quickly" to pass it. The news agency reports that the Senate leadership is "in talks with House leaders on ways to win fast passage" of a deal in both chambers. 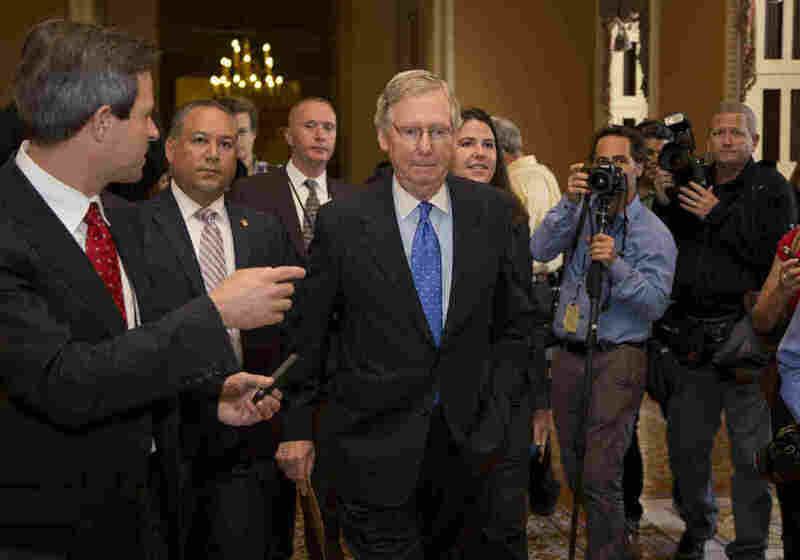 A senior Republican U.S. Senate aide tells NPR's Tamara Keith "we're still working on things. Should know more later this morning." Senate Majority Leader Harry Reid (D-Nev.) and Minority Leader Mitch McConnell (R-Ky.) were set to pick up the pieces following a fractious and fruitless night in the House that did little more than run down the clock. "Given tonight's events, the Leaders have decided to work toward a solution that would reopen the government and prevent default," McConnell spokesman Don Stewart said in a statement. "They are optimistic an agreement can be reached." Their effort to forge a deal acceptable to both parties to restart the government and renew its authority to borrow was given fresh urgency on Tuesday by a warning issued by Fitch Ratings, the third-largest credit rating agency, which said the debacle in Washington meant it was placing the country's long-term credit rating under review for a potential downgrade. Treasury Secretary Jacob Lew has said that the government's ability to pay its bills cannot be guaranteed after midnight Wednesday, but the exact moment when that occurs might be days or even weeks later. On Tuesday evening, House Republicans tried and failed to produce their own plan for ending the stalemate. In the end it wasn't Democrats who scuttled their efforts, but divisions among GOP lawmakers. In the early evening, the House had crafted a plan to end the shutdown and raise the debt ceiling in exchange for some changes in the Affordable Care Act, which has been a key stumbling block throughout the weeks of negotiations. But when Heritage Action for America, a lobby group affiliated with the conservative Heritage Foundation weighed in against the plan, what little resolve that might have existed quickly evaporated. "[Battered] from three years of intra-party battles, [he] was caught between at least three different GOP factions as he tried to craft a compromise agreement: Republicans who didn't want to slash government health care contributions for Capitol Hill aides, members who thought repealing the medical device tax was a giveaway to corporate America and conservatives, who thought Republican leaders were too soft on Obamacare. "Boehner was unable to craft a deal that would satisfy all of the groups, forcing him to shelve his plan and show the world — again — just how hard it is for him to rule the raucous House Republican Conference. "No amount of political gymnastics would help him reach the crucial 217 vote-level to send a bill to the Senate. GOP aides said that Boehner was — at a minimum — 20 to 30 votes short of the target." Amid the disarray in the House, the Senate "quickly moved to pick up the pieces," as The Washington Post writes. Senators restarted talks of their own and were thought to be close to a deal before they adjourned just after 10 p.m. Presumably the Senate plan would be close to a proposal outlined Tuesday that would fund the government through Jan. 15 and raise the ceiling until Feb. 7 in exchange for "substantive" discussions on entitlements and other Republican budget priorities. The White House has hinted that it would agree to such a deal. Even so, Politico, quoting unnamed sources, says that "the deal is essentially done." "Reid and McConnell are expected to brief their respective caucuses Wednesday, hours before the country could fail to pay its bills for the first time in history. Cooperation will be needed from members of both parties in order to avoid default as well as to end the first government shutdown in 17 years. And a Senate plan will need to clear the House." And passing the House is still the biggest question.